Do Energy Efficiency Investments Deliver? Evidence from the Weatherization Assistance Program, by Meredith Fowlie, Michael Greenstone, and Catherine Wolfram, is a paper published last year in the Quarterly Journal of Economics which illuminated my understanding of claims about conservation. we believe that the most likely explanation is that the [National Energy Audit Tool] systematically overstates the real returns to these investments by a significant margin. It is noteworthy that we found in our data that the NEAT program predicts baseline natural gas consumption that exceeds actual consumption by more than 25% prior to weatherization, suggesting that the auditing tool could be underestimating homes’ efficiency properties prior to weatherization. The efficiency gap is useful in thinking of the spending that produces the levelized cost estimates. I'll return to this, but consider the possibility there is organic improvement in efficiency allowing the same work to be done with less energy, and that this adds to the difficulty in measuring the accomplishments of program spending. The United States' Energy Information Administration (EIA) is very well respected for its reporting ,if not its forecasting. They recently credited the majority of reductions in greenhouse gas emissions, since 2005, to "lower demand growth" - as is to be expected viewed from a conservation-first paradigm. Not expanded upon is the claimed reduction in demand growth since 2005. The EIA does archive its annual energy outlooks, and they haven't justified an expectation of 2% growth for the past decade. Although in 2005 the EIA was projecting an increase of 1.9 percent a year (to 2035) by 2010 expectations for growth were reduced to 1% per year, with an acknowledgement growth had been slowing for decades and a graphic to prove it (one I included in a post during my first month of blogging in 2010). EIA forecast are often criticized for not having been great predictors of what actually occurred. Defenders of those forecast point out that they aren't meant to do that, but to forecast what would occur absent new policy action. This makes the, "If demand growth had remained near 2%" in 2018 reporting a particularly vapid statement - for almost a decade demand growth was not expected to be at that level even absent new policy initiatives. But demand growth has been more tepid than even the 1% expectation. It would be difficult to attribute this entirely to programs addressing an "efficiency gap." An analysis of the decline in electricity us in U.S. Households by Lucas Davis indicates the big factor driving reductions from 2010-2015 was "energy-efficient lighting". Davis noted, in the 2017 work, "energy-efficient lighting now accounts for 80% of all U.S. lighting sales." It is wonderful seeing the impacts of true efficiency in using less electricity to provide the same brightness. It does bring up a couple of difficult questions, such as, "what program shall we attribute it to", and "who should pay for whatever was spent?" I'll address the second question first. Energy efficiency is considered cost-effective when the net cost of installing and maintaining measures that improve the efficiency of energy usage is less than the total cost of building, maintaining, and operating the generation, transmission, and distribution facilities that would otherwise be needed to supply enough energy to achieve the same end-use over the same lifetime. So while Joe will clearly benefit from buying a better light-bulb which consumes much less electricity, maybe everybody gets some benefit from Joe having that light-bulb. capital is fungible and can be instantly redeployed. None of these precepts holds true in the regulated energy field. In particular, consumers seldom have perfect information; and low-income households, small businesses, and others have limited or very limited access to capital. For many end-uses, therefore, we have what is known as market failure: customers will not “make the rational choice” on their own. Market failure explains the inability of customers to "make the rational choice", and if I understand the theory correctly this could describe the efficiency gap. “parties that would implement efficiency measures even in the absence of the scheme and take direct advantage of it”. Ontario's system operator claimed, in its most recent annual report on energy-efficiency activities, for 2017, a LUEC of 1.69 cents per kiloWatt-hour (c/kWh), which is down 20% from their claim for 2016 and less than half of the 3.5 c/kWh claimed in 2015. Most claimed reductions in electricity consumption are identified as coming from lighting, and the vast majority of those savings are from residential programs that moved from coupons to instant discounts. There's enormous room to be skeptical about the claimed LUEC given reports LED lighting already own the market. Moving to instant discounts no doubt saves some costs in printing and distributing coupons, but it also manages to capture more free riders than any other program could. All of them. The LUEC for the "Instant Discount" was reported as 0.59 cents/kWh: it's achieved by making it impossible for shoppers buying the light bulb they are most likely to buy not to get a ratepayer financed discount for doing so. The regulator in the province is the Ontario Energy Board (OEB), which recently released a report on reforming itself that the government has acted to facilitate. A regulator should be looking for specific market failures, and have specific tests to assure the broad rate base benefits from energy efficiency spending - not simply the person that takes advantage of the program. I don't believe it benefits me and my neighbours to chip on somebody else's lightbulbs, or they on ours. I don't believe we should have programs designed to capture 100% of all potential free riders. The LUEC is a difficult measure to assess, but the economic logic in determining whether the assessment is necessary is not difficult, and funding individuals' light bulb purchases is not something general ratepayers should be forced to do. Fortunately, in Ontario, the government has issued directives ending the residential rewards that have been reported to have the lowest LUEC of any energy efficiency measures. I chuckled on seeing the top 5 states for energy efficiency according to the American Council for an Energy-Efficient Economy (ACEEE), because of a graphic I included in a report I creating in learning Power BI using EIA data. Online the BI report is animated, so you can see the rates and consumption change over time by hitting the play button (you can maximize the graphic with the box with the arrow that appears at the top right corner of the screen). If you visit the report page note the variance in the maps shown there: rates are not indicative of monthly bills. Whereas the northeast generally has the highest rates (only California looks out of place), the south and southeast have the highest electricity bills. This could simply indicate the northeast uses a lot more energy in the form of natural gas, or oil, for heating whereas load in the south is driven by air conditioning powered by electricity - and a quick search for data on home energy spending does indicate four of the five top states for energy efficiency are among the states with the highest average home energy expenditures. I don't mean to imply by mentioning I chuckled that I have proof energy efficiency programming is not paying off in those states - just that if I sorted for states for the highest rates it would be pretty close to the ordering of energy efficiency accolades. The EIA data provides total billing dollars, number of consumers, and total sales - so the figures are easy to calculate. Ontario is not easy to compare, because there's no great source for total billing to consumers (inclusive of all charges). 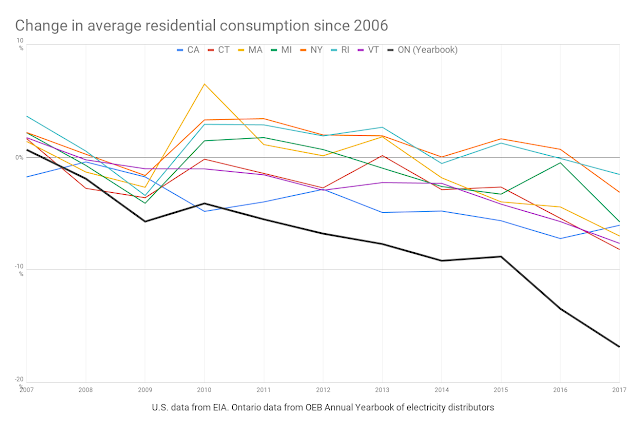 Ignoring cost for the moment, I collected residential consumption data from Ontario Energy Board yearbooks of electricity distributors (my compiling of the data can be found via this page), and calculated the percentage change since 2006 in both data sets. The reduction in average residential consumption in Ontario is twice what it has been in any of the comparison states (the top 5 for efficiency according to the ACEEE as well as our neighbours Michigan and New York). Celebrations of the efficacy of Ontario's energy efficiency programming in building a "culture of conservation" may be premature. Ontario's consumer rates rose quicker than anywhere else in North America for most of this period so demand being down more would be very basic economics. Not so basic economics indicate the long-term price elasticity of demand will be greater than the short-term, making Ontario's sudden about-face in 2017 in cutting residential rates by 25% or more an intriguing potential case study. Utility costs go up to pay for all or part of the cost of energy efficiency measures. In addition, utility revenues decline because the customers installing the energy efficiency measures use less energy. As a result, higher utility costs must be divided among fewer utility sales in setting rates, and rates per unit of energy go up, even though the total of customer energy bills goes down. The denominator (kWh) should be lower , but if energy efficiency is cost effective the numerator should also be lower than it otherwise would be. I believe the point should be that the cost of energy (kWh) is one component of electricity bills, and the other components are largely fixed - but as many proponents of efficiency promote dubious claims of savings on transmission and distribution the point is unlikely to be discussed. Regardless of the confused presentation (mine or generally), it's true that places with lower average consumption, such as the ACEEE's top states discussed above or countries including Germany, don't have greatly lower cost due to having much higher rates. If we accept the premise that lower consumption must equal higher rates Ontario's [un]Fair Hydro Plan guarantee to deficit-fund lower rates, and hold future rate increases to inflation rates, meant that efficiency spending would raise the deficit level: if rates can't rise revenues must drop on reduced consumption. The current government's plan to change the subsidy of current rates, from a bond debt scheme onto the tax base, doesn't change this as they still commit to holding rate hikes to the inflation rate. This means the only way to lower the electricity sector's cost to the public budget is to increase consumption. 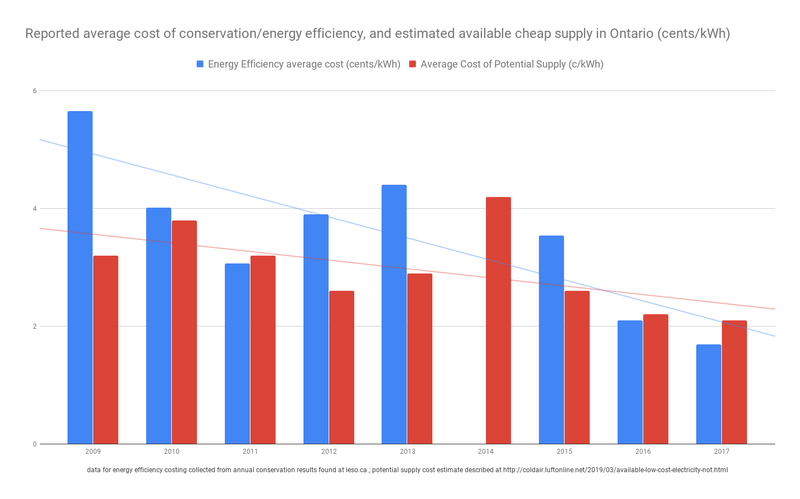 The economics are pretty clear: there's no excuse for spending on residential energy efficiency programs in Ontario. You should end a discussion when somebody says, "and of course efficiency, we have to do all the the conservation we can first", but simply to get away from them. If you want to escape without encouraging them further, maybe end it with "f'in efficiency" and a roll of your eyes.